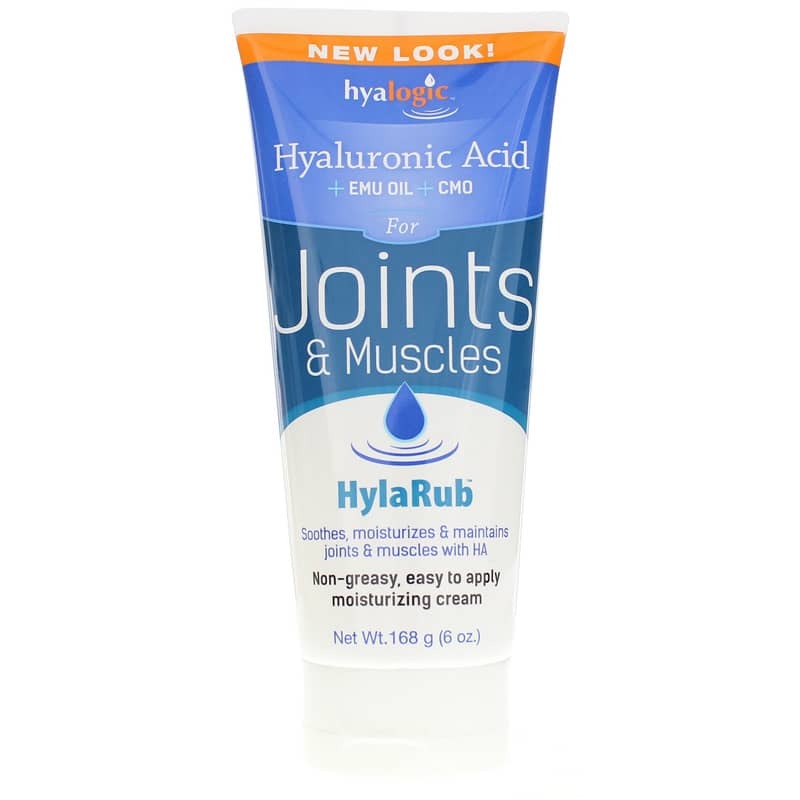 HylaRub Moisturizing Joint Cream with Hyaluronic Acid, Emu Oil and CMO by Hyalogic is a natural way to soothe sore muscles and joints. HylaRub is a pleasant smelling cream which uses patented ingredients to help sooth, moisturize and maintain healthy joints and muscles for an active lifestyle. Contains Emu Oil to penetrate deep into the skin tissue. Hyaluronic acid (HA) is a carbohydrate, more specifically a mucopolysaccharide occurring naturally throughout the human body. When not bound to other molecules, it binds to water giving it a stiff viscous quality similar to "Jello". This viscous Gel is one of the most heavily researched substances in medicine today with thousands of clinical trials mostly in the fields of orthopedics and eye surgery. Its function in the body is, amongst other things, to bind water and to lubricate movable parts of the body, such as joints and muscles. Its consistency and tissue-friendliness allows it to be used in skin-care products as an excellent moisturizer. Hyaluronic acid is one of the most hydrophilic (water-loving) molecules in nature and can be described as "natures moisturizer for the joints and muscles." Cetyl myristoleate (CMO) is a matrix of fatty acid carbons which have been scientifically arranged to achieve maximum efficacy for joint mobility and muscle health. CMO systematically enhances and lubricates cell membranes throughout the body providing youthful cell fluidity and elasticity. This includes the enhancement of fluids that cushions your bones and joints to maintain flexibility and mobility so that you can move freely. With its unique molecular structure, cetyl myristoleate acts in 2 unique and beneficial ways to maintain joint health and performance. Cetyl myristoleate stimulates joint lubrication to help with stiffness and maintain joint mobility and range of motion. Cetyl myristoleate helps to regulate the bodys immune response to joint problems. Emu Oil is highly moisturizing and natural skin softener that has wonderful skin rejuvenating properties Known to be used by the Aborigines of Australia for many years as a natural food source and skin care regimen. It is also non greasy and highly penetrating. In fact Emu Oil has demonstrated to be one of the fastest and most penetrating oils into the skin, making it an excellent trans-dermal carrier for any other added moisturizers or active ingredients. It has only come to the attention of the U.S. market over the past few years as an alternative substance and has a wide range of health benefits. Consumers are currently using this deep penetrating Emu oil for supporting healthy joints and muscles by applying it topically. Adults: Sparingly apply soothing cream to skin around the joints and muscles as needed. HylaRub with Hyaluronic Acid works better than anything else I have tried. This product actually does everything as advertised. I'm 70 years old...this product works. My wife uses it too...she is sold on it. I use the HylaRub mainly on my hands. Works well and since you only need a very small amount the 6 oz tube lasts a very long time. The relief is amazing and lasts quite a long time.